A little late for starting my Counterfeit Kit Challenge this month, but I couldn't pass up the opportunity. 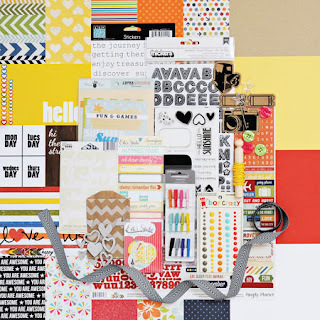 This month's kit from Scrapbook and Cards Today, is their Summer Fun Kit. The colour combo is exactly what I need to tell a special story for which I have printed way too many photos, and have struggled with design ideas due to the bold colours. Red, yellow and black and the grand opening of our new (new then, is it three years already?) grocery store. Buy Low Foods is a pillar in our community and I have a lot to say on the pages that will come from this kit. Starting with the papers. The cardstock is all from Close to My Heart. I winnowed it out of some kits that are sitting on the shelf. In fact, a lot of this kit is from CTMH. My stash was treated to a shopping blitz earlier this year, and it is time to start working all the lovely bits into the regular arsenal. While I dithered as to whether or not to build this kit, (I have four on the go, as it is) I discovered that I actually had one of the exact pieces of patterned paper as featured in the kit. This is the first time that has happened for me, since I started playing with CKC, last July. I took it as a sign to move ahead. K&Company, from a boys stack that I have dismantled and discarded the cover. The Ebay stash is from my early days of scrapping when I bought a very large amount of paper off of Ebay. Some of it I liked so much, I ordered it again. It will be a long while until I no longer look at a sheet and think to myself "Oh yes, that one is from the beginning." American Crafts, Dear Lizzy, Lucky Charm, Starlight. It has only been in my stash since May when I went shopping with the express intent to find some dark blue patterned paper as I really didn't have any on hand. I suppose this kind of points out why I don't ever seem to have any papers that are featured in the inspiration kits. The kits are current. My stash is not. Shopping the 5 for $1 box in the back of the store doesn't help in this respect either, but I figure, next month (or season) all the full price items on the shelf that are left will be in the clearance section. The way I hoard paper, it makes little sense to shop full price, new lines. They all turn old(er) in my drawers, anyways. Then I went on to the alphas and embellies. This month I just grabbed items that appealed rather than trying to match to the kit. It made the process a little faster. CTMH, For Always Assortment, pins and buttons. sei, Pearl and Rhinestone Brads. four laminate samples from building supply store. CTMH, acrylic stamps, Picture Perfect. Magnetic fridge poetry words, muk. Polkadot bias tape, bulk roll at sewing supply store. yellow bakers twine, from esty, muk. American Crafts, Flair Badges, Delish. CTMH, Harvest Charms, Antique Copper. CTMH, Color Ready, Kraft Borders. Autumn Leaves, Stencils, J-Q and R-Z, going to cut off the words from these as haven't used them as stencils yet, in the 5 or more years that they have been in my hands. ColorBok, Woodland, Two sheets of alphas and die cuts from the stack. Heart boarder strip I made a ways back using CM boarder system. Daisy Bucket Rub-ons. I have a bunch of these in a sealed bag. Will try to use as many as possible. Rub-ons have a shelf life that make them a bad choice for hoarding. Creative Memories Enchanted, ABC stickers. They are red so they help resemble the original kit. And I have some very exciting news. This weekend, Mr. Muddle, myself and two of my scrapping besties are going away for the weekend to scrap and practice yoga and a retreat entitled "Scrapoga" Nothing beats dragging a car load of cases and boxes to a different location to get you reacquainted with what you really need to scrap. And what you really need is usually something you left behind. But with a dozen or more avid crafters on board, someone is sure to have a purple passion ink pad, or baby brad in chartreuse that you can use to complete that perfect layout. I am looking forward to chronicling some important (to me) stories about our local grocer. It's one of those thing I keep putting off because I don't know exactly how to approach it and I don't want to do a poor job of it. But the time has come to stop deliberating and start telling. It's my job, as a scrapper, to get the story down, because if I don't, no one else will. Wish me well as I tell the story (from my perspective) of our grocer, Buy Low Foods, and their commitment to our community. Thanks for dropping around. Double thanks for comments. And, as usual, you have a bodacious kit to play with. I love that you have a story to tell this month - perhaps you will put together a mini-book while away on your retreat? I'm anxious to hear the tale. Amazing Kit - well chosen. I must remember to use my ageing rub-ons too - some have already died! How lovely that Mr Muddle is going with you ... does he scrap too or is he just the driver? Mr. M. is a scrapper. Yoga will be a new endeavor for him, though. awesome! Wish I was going too! Great kit and its all about the inspiration ! glad to see you back! Always miss you when you are not around. And i LOVE the idea of making up a kit to tell such a special story. When I travelled through the Yukon, we didn't see many shops at all, but the ones we did certainly felt like the heart of the community. Good for you for telling the story and getting it reflected. Important words that I look forward to seeing.